Amherst Island is situated west of Kingston along the northeastern shore of Lake Ontario. It is 20 km (12 miles) in length from Bluff Point in the southwest to Amherst Bar in the northeast, and is 7 km (4 miles) across at its widest point. The waters of Lake Ontario flow past Amherst Island into the funnel that becomes the St. Lawrence River and the Thousand Islands. The island is perfectly situated within easy reach of Toronto, Ottawa and Montreal. It can only be accessed by ferry, however, which has contributed to the island’s cultural and natural heritage landscape preservation, allowing it to remain a hidden gem. Today, after disembarking from a 15-minute ferry ride, people are immediately struck by a sense that time has stood still. Property owners number about 200, including seventh-generation “old islanders,” whose families first immigrated to the island from what is now the Borough of Ards, County Down, in Northern Ireland. Many landscape features here reflect the original settlement fabric of the island, including the roads, farm lot layout, farmsteads, villages and dry stone walls, most of which are almost unchanged in over 150 years, and which are part of the island’s cultural assets. Amherst Island’s cultural heritage landscape includes the trees along the fence-lines and the world-famous Owl Woods – a birding location where you can spot eight species of owls on a single winter’s day. Vistas across the interior of the island have not been significantly altered by development as the vast majority of the new houses have been built on the shoreline. The island’s historical buildings and cultural heritage landscape features, in the form of dry stone walls, are among the most tangible remnants of early Irish-Scottish settlement and development. 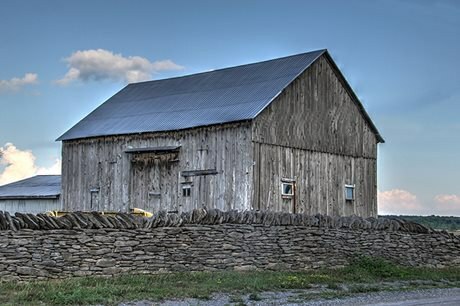 From quaint old homes and buildings in the village of Stella to solitary farmsteads and outbuildings, to dry stone walls/fences along historical roads, these resources provide us with a link to Amherst Island’s rich past as well as a sense of continuity in this rapidly changing world. In particular, the dry stone walls provide cultural heritage value, and exhibit integrity of unique form, location, craftsmanship and materials. In 2004, the Amherst Island Women’s Institute hired a local stone mason, Bill Hedges, to train them on the basics of dry stone walling so that they could begin repairing two significant walls – Pentland Cemetery and the Hitchins Farm wall. Over a period of five years, with many volunteers supporting the venture, these projects were accomplished. The migration of the Irish played a significant role in bringing people to Amherst Island who had the skill, knowledge and heritage to build these walls. The bedrock was relatively shallow and farmers were constantly removing rocks as they ploughed the soil. Those early settlers did what they knew best with their abundance of rocks: they built wonderful stone walls. Thirteen dry stone walls have received bylaw designation by Loyalist Township as having cultural heritage value under section 29 of the Ontario Heritage Act, with more to be documented. These same walls were celebrated last year during the Irish-Canadian International Dry Stone Festival. VIPs, including Ontario’s Minister of Tourism, Culture and Sport, Ireland’s Ambassador to Canada and author Jane Urquhart, were in attendance. More than 40 professional wallers from Ireland, Scotland, the U.K., Canada and the United States also attended. Even the CBC’s Rick Mercer and his crew spent a day at the festival! The event was so significant that an MPP stood in the Ontario legislature to comment on her experience. In addition, Dry Stone Canada was awarded the 2015 Lieutenant Governor’s Award for Conservation Excellence by the Ontario Heritage Trust. Amherst Island is now on the map – for its significant cultural heritage landscape. People in Canada and elsewhere are coming to see for themselves what makes this island such a treasure. Andrea Cross has worked in the exhibition, heritage and cultural attractions business for over 20 years. Currently, she is a member of the Loyalist Township Heritage Committee and the County of Lennox and Addington Economic Development Committee, as well as the Administrator for Dry Stone Canada.